The Shade Tech Instant Patio Canopy is your ideal travel companion for tailgates, afternoons at the beach, lawn parties and more. Simply extend the fully assembled, 1-piece frame and lock in place for instant setup. Polyester canopy slips over the top of the frame and secures in place with hook-and-loop closures. Contents include canopy top, frame and stakes all packed in a wheeled carry bag for added convenience. 10' x 10' Sporting event and beach ready recrational grade ez up pop up instant canopy. The Headway compactable frame folds down to 48" to easy fit in the trunk of most vehicles. Lightweight black powder coated steel frame with open top roof design for optimal head room, metal footpad, and pinch resistant locking pins. Includes 210d Polyester Top that is water resistant, fire retardent. Includes Polyester roller bag, grounds stakes and rope. Comprend un dessus en polyester 210d risistant ` l'eau, ignifuge. Comprend un sac ` rouleaux en polyester, des enjeux et une corde. Shade Tech affordable, quality canopy offers reliable shade where you need it with this reliable slant leg pop-up canopy. Features 3 height positions for variations, a rigid eave construction and shade up to 64 sq. ft. Our Aluminex fabric offer 99% UV protection and the push button sliders with padded levers make this canopy easy to assemble. 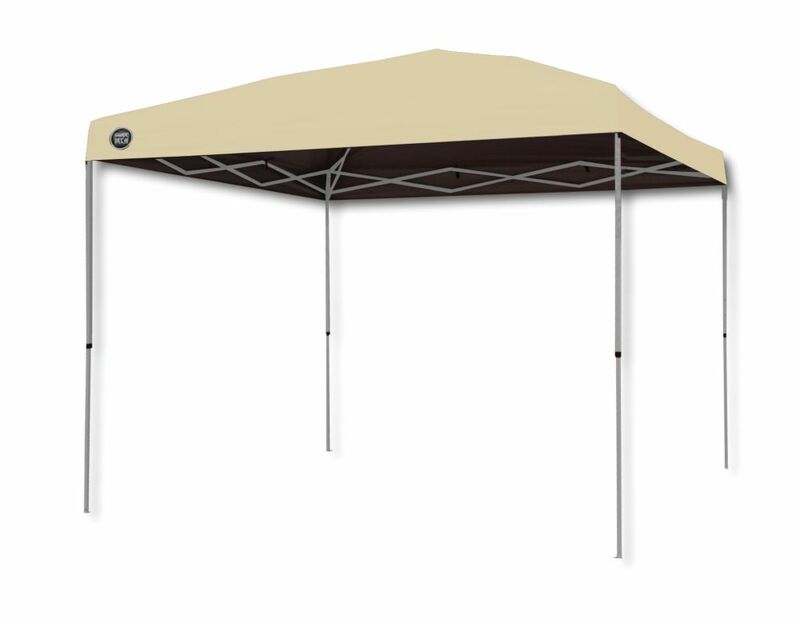 10 ft. x 10 ft. Canopy in Khaki The Shade Tech Instant Patio Canopy is your ideal travel companion for tailgates, afternoons at the beach, lawn parties and more. Simply extend the fully assembled, 1-piece frame and lock in place for instant setup. Polyester canopy slips over the top of the frame and secures in place with hook-and-loop closures. Contents include canopy top, frame and stakes all packed in a wheeled carry bag for added convenience. 10 ft. x 10 ft. Canopy in Khaki is rated 1.0 out of 5 by 2. Rated 1 out of 5 by Alleycat from Cheap Junk!!! First time I set this up, anchored into ground, tied down (pins and ties are not included) a stiff breeze came along and twisted it like a pretzel. The uprights actual bent at the top. This is a cheap piece of garbage. Unless you plan to set it up where the is NO wind (like indoors), DO NOT BUY IT! I now have a bunch of scrap aluminum. Had to go buy a better one the same morning. Can't believe the manufacturer would produce something this cheap and shame on Home Depot for selling it. Junk. Total junk.